How Long Can China Grow At This Rate? The debate about future growth in energy consumption is obviously informed by, if not centered on, the spectacular growth in China. China’s growth since 2005 has been just as spectacular, averaging about 10% per year. But looking ahead towards 2030, 2050 and 2075 (which is the purpose of this weblog), we run into a dreamy, ‘yeah but’ quality in discussions about China. If you Google the phrase ‘Can China Sustain Growth’, you get more than 5 million search returns, and a lot of the links go to reasoned arguments making the case that China cannot, in fact, keep growing at the same rate. And maybe they can’t. I note that people have been pessimistic about China’s growth for twenty years without being right yet, but if their thinking is sound, it may just mean that they were premature in their bearishness. And that happens a lot. I’m not competent to evaluate the real future of China’s economy. I suspect that they’ll continue to grow robustly but have periods where growth slows dramatically. That’s sort of what happens to countries after they pass a certain point in development. 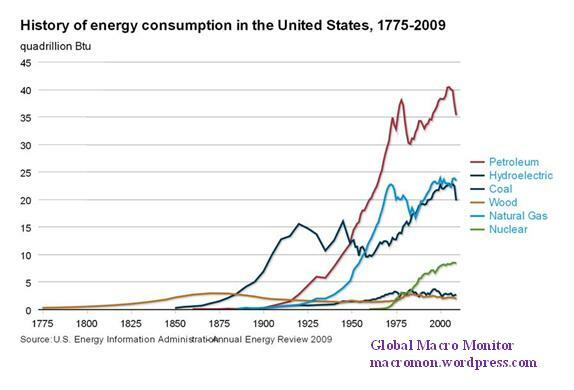 Our energy use climbed dramatically from 1900 to 1975. That period included the Great Depression, two world wars and several recessions. I think once a developing country gets a taste for energy, it’s tough to let go. There is no need to worry about China, simply because the greenhouse conjecture is not based on real world physics. Prof Claes Johnson has proved in Computational Blackbody Radiation* that energy in radiation only gets converted to thermal energy if the peak frequency of the radiation from the source is above the peak frequency of the radiation from the target. This essentially provides a mechanism which explains why the Second Law of Thermodynamics also applies for radiative heat transfer, as it does for heat transferred by conduction. There seems no plausible alternative explanation for the observed Second Law, so I suggest we all heed what Johnson has deduced mathematically, being as he is, a Professor of Applied Mathematics. Thus the IPCC “backradiation” cannot affect the temperature of the surface and there can be no atmospheric radiative greenhouse effect. Looks like there’s a saturation point for given technologies and level of disposable income. I wonder what that is to China. Their emissions, because of their energy portfolio and rapid growth of heavy industries, will probably end up being somewhere between European and US per capita emissions. I think you’re probably right–but it seems pretty clear that it is in everybody’s best interests to steer them towards a northern European model of consumption if possible. What are the policy levers they can use–and how can the west support them? Or is it any of our business at all? I predict China will continue to grow at similar rates to the recent past until its population becomes around 80% urbanized, compared with 50% now. After that it will slow to rates comparable with western nations. This might happen around 2040, which is also about when the population will either stabilize or drop, depending on fertility rate assumptions. The population then will be about 1.4 billion. Those who think China cannot maintain high growth rates are ignoring the extremely low productivity of peasant farmers compared with urbanized populations. As long as China continues to turn the former into the latter at high rates, it will continue to enjoy rapid growth. Of course this all requires massive construction of housing and associated infrastructure. Many mistakes will be made along the way, no doubt, but the way we currently count GDP even mistakes are counted as productive economic activity. Impossible to do it any other way, since the mistakes become obvious only after the event, if at all. The continued high level of construction will mean continued high demand for raw materials and energy. I’d be surprised if China is not approaching European rates of per capita energy consumption by 2040. Hi Doug, without diving too deeply into the climate controversy I’d like to ask you this. Even if the connection between concentrations of CO2 and climate change is not as rock-solid as champions have asserted over the past decade, are you comfortable with other effects from increased energy use? We are discussing annual consumption–every blessed year–of as much energy as the world used between 1990 and 2000. As I mention elsewhere on this weblog, I am deeply concerned that if coal is the dominant fuel for burning 3,000 quads per year, the consequences just in conventional effects are serious. And at some point, the atmosphere may well sit up and take notice of that much CO2. Your thumbnail description of possible futures fits well with mine. Any thoughts on consequences or ramifications? I think gas will rapidly replace coal as a fuel for electricity generation, starting from about 2025 or 2030. I’m inclined to agree with Dave Rutledge that peak coal is a lot closer than people think, for a variety of reasons which he has detailed at some length. Gas’s reign as the premier fuel for power generation will probably be brief (ie maybe fifty years), with (much better) nuclear generation to take over. I don’t think renewables will ever be more than a niche player, because of cost and intermittency issues. As a consequence, I don’t think the consequences of China’s continued economic growth will be anything but positive. Then again, I’m not in the CAGW camp anyway. I’ve always considered it a totally exaggerated danger, the latest in a long line of manufactured eco disasters for the greenies to bash their fellow man with and assuage their guilt for being born human. While the amount of energy used in absolute terms is very important to consider when thinking about the environmental repercussions, it is also useful to take a look at economic energy intensity trends. You can’t sell people a clean and efficient energy future if they think they’ll have to sacrifice economic growth to get there. I sure hope you’re right. I’m (for now) focusing on absolute figures because I don’t think there’s very much awareness of the scope of the issue right now. China has the opportunity to do something that almost no nation has done before: design cities (big ones) from scratch. It offers opportunities to include build-in energy-saving measures and characteristics, eliminate waste and improve logistics. District heat, air heat pumps (A/c in the summer, heating in the winter), efficient public transportation and building codes could make a big difference. That is the coolest thing I’ve seen all week, Jarmo. It will end up being at least one post. Want to write it? Thanks for the compliment. I’d have to look into this more carefully. The pictures and ideas on the website look good but I’d like to look at the solutions, costs and actual performance figures (energy generation etc.). I’m sure cost-effectiveness means a lot if these design are to be developed further and duplicated on a large scale.